VE's Fantastical Nonsense: How did THAT happen? I know it's been awhile now. No...I'm not talking about idiots bombing our National Sporting pastimes. 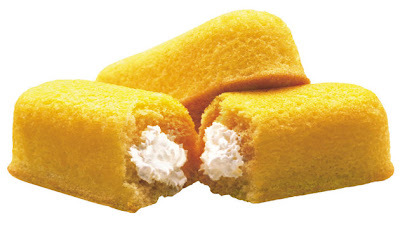 Twinkies go out of business? I've been crying ever since they took my beloved Hostess mini donuts away. I wish I could say I care about the Twinkies but it's been years since I have eaten one. And maybe the Ding Dongs were better anyway or the chocolate cakes with the white drizzle on it. I guess I really miss some of their pastries but I was used to buying more things from Costco then any store because they seem to make it more like homemade and none of those preservatives that mean it will last for years. Hey maybe that is why they went out of business but then again it was the union thinking it held all the power. Gotta love those unions. I'm sure it's what caused the downslide of the nation. ...now that I think of it...maybe you should fear! mrsupole - We all have our Hostess memories, for sure. I remember finding one in my Dad's garage that had been there for like 15 years...still looked new! subby - Subby! It has been awhile. Glad to see you out in the blogsphere. You know, I did hear that somebody was going to buy the name and make them again. What would all the post apocalyptic movies do without a search for Twinkies?